On January 12, 2009, David Stephenson, Director of Operations at EIA, met with the President of Bolivia, Evo Morales and Sacha Llorenti, Evo’s Chief of Staff. In that meeting David requested the support of the Bolivian Government in funding EWB projects in Bolivia. 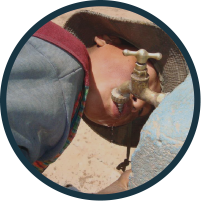 The Bolivian National Government has given millions of dollars (US) to the municipalities (like county governments) to do projects, similar to EWB projects. However, the Municipalities often don’t have the experienced people to hire someone to come in to their community and do the work. We also found out that the Municipalities can give up to $10,000US without bidding, to projects which have been through a prioritizing process. So here is what David proposed to the President. That our EIA engineers go to some of the Municipal governments and look at the projects and see which ones would work as EWB projects. We then work in partnership with the Municipal and local community leaders to develop the project as EWB projects (fill out the form #501). Then once it is adopted, the Municipal Government will give $10,000 to the project, and EWB provides free engineering design and will raise the additional funds needed to finish the project, with a maximum of $30,000 per project ($20,000 from the chapter). President Morales and his staff were quite positive about this approach. In addition to that, they pointed out that the Government has designated 30 specific Municipalities as the poorest in the country, and they asked if we could focus on them. David said that it would, of course, be possible. This was followed up a week later with a meeting with David Churquihaunca, the Foreign Minister. Mr. Churquihuanca was fully aware of the previous discussions (he had obviously been briefed) and completely supportive. This should be a good deal for everyone. The Bolivian Government gets up to $30,000 in materials and free engineering for a project which only costs them $10,000. And the EWB chapter doesn´t have to raise the first $10,000 of the materials cost. And finally, we can tell people that they will be working in one of the 30 poorest Municipalities in the second poorest country in Latin America. Sacha Llorenti, who is the equivalent of the Chief of Staff to President Morales, will be bringing together those 30 municipalities and discuss this project and get back to David. We will keep you informed. "I had the opportunity to examine relationships grow to fruitful outcomes in Potosí. EIA teamed up with a group from the University of Oklahoma to hold a course on Passive Water Treatment Systems. The course was held in the University of Potosí and was a joint effort on the parts of the University of Oklahoma and the University of Potosí." "Students, me included, were taught of the devastating outcomes of mine contaminants on water and how to build and use Passive Water Treatment Systems for managing these contaminants." "I also had the chance to accompany the Oklahoma University team in their field work outside of the classroom. 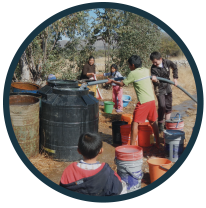 As a Civil Engineering Major with a focus on Water and Sanitation Engineering I was most interested in the water contamination from the mines scattered throughout Potosí." "I helped collect water samples, read pH, and learned the meaning of the different pH’s in respect to contamination in the water. In addition I gained a general knowledge of the affects of the contaminants on the land and in the crops, which explained a great deal about the communities’ health issues and sanitation problems." "My experience in Bolivia gave me a greater comprehension of various aspects of civil engineering and a better grasp on the importance of collaboration. The work being done in Bolivia and those working on it are incredible testaments to growth, and the education and insights I received are information I will continue to pull from…"